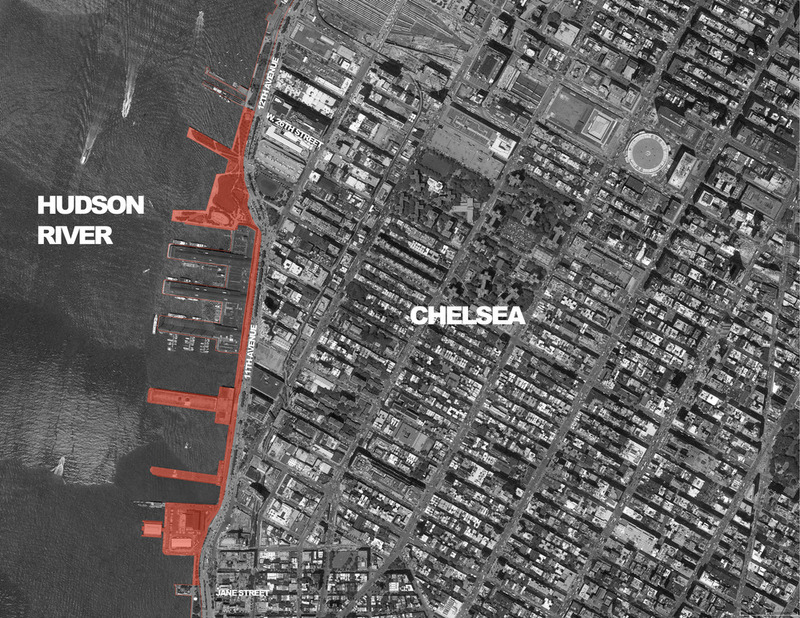 As a part of the greater Hudson River Park, this project aims to create a continuous waterfront park with open green spaces and attractions ideal for walking, biking, and recreational use along Manhattan’s Western Waterfront. The park connects Battery Park to Riverside Park by extending from Battery Place to West 59th Street. As the longest waterfront park in the US, the five miles are divided into seven segments of which Segment 5 makes up 16 of the total 550 acres. A majority of the overall park’s acreage is dedicated to an estuarine sanctuary. The waterfront park transforms the once industrial waterway of the Hudson River into a usable space for the residents of Western Manhattan. The design reflects the ideals of historic and modern landscape architecture in what Governor George E. Pataki referred to as “the Central Park of the 21st Century.” The location of this park is significant in its historical context to provide residents with green space instead of a major highway that was proposed in the 1970s. 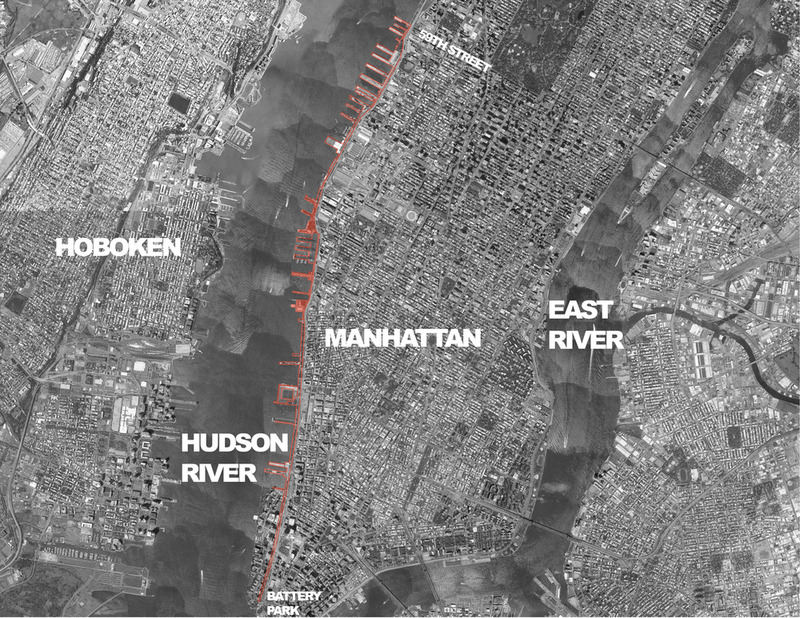 Due to the proximity of the park to the busy west side highway, topography became a critical element to visually and acoustically separate people from the roadway. At segment 5, this was done through creating earth berms surrounding the park’s extremities and critical program areas. The Lenape Native American tribe first realized New York’s propitious position in world commerce when they set up a trading post and route along the Hudson River waterfront as early as the 1400s. The trade potential was maximized after the opening of the Erie Canal in 1825 created an accessible passenger and trade route. Over fifty piers lined the Western waterfront, but when shipping began to decline in the twentieth century, the piers were left in a state of abandonment and residents had no connection to the waterfront. 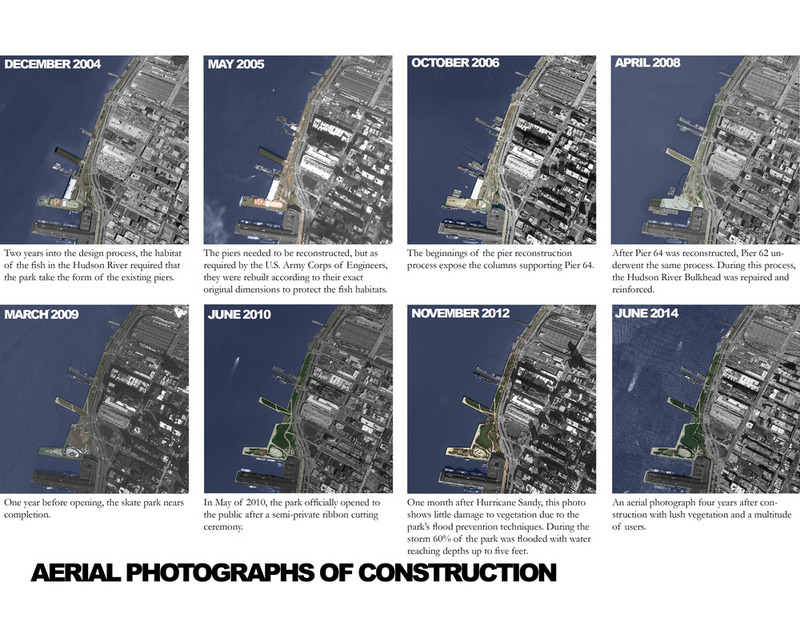 Slowly select piers began to be removed and today the majority of the remaining piers have been transformed into pieces of the Hudson River Park or into recreation centers similar to those at Chelsea Piers. Discussion for how to develop the abandoned waterfront began after a sixty-foot segment of the West Side Highway collapsed in 1973. This highway, the Miller Elevated Highway, was built during the 1930s and created access to the docks and warehouses through its elevation. However, due to constant exposure to seawater and over usage, it collapsed, leaving the city in need of an automotive thoroughfare along the Western edge. 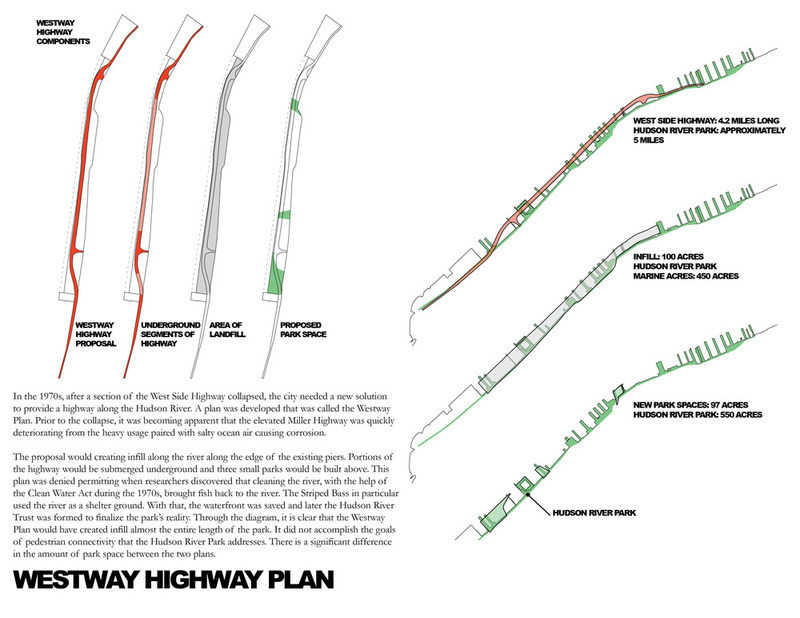 In the early 1970s, the Westway Plan was proposed to add landfill to the existing piers while creating an underground highway with three small park spaces atop. This plan was denied permitting when researchers discovered that cleaning the river, with the help of the Clean Water Act in the 1970s, brought the Striped Bass and other fish back to the river as their shelter ground. In 1996, the Joe DiMaggio Highway began construction in place of the Westway Plan. 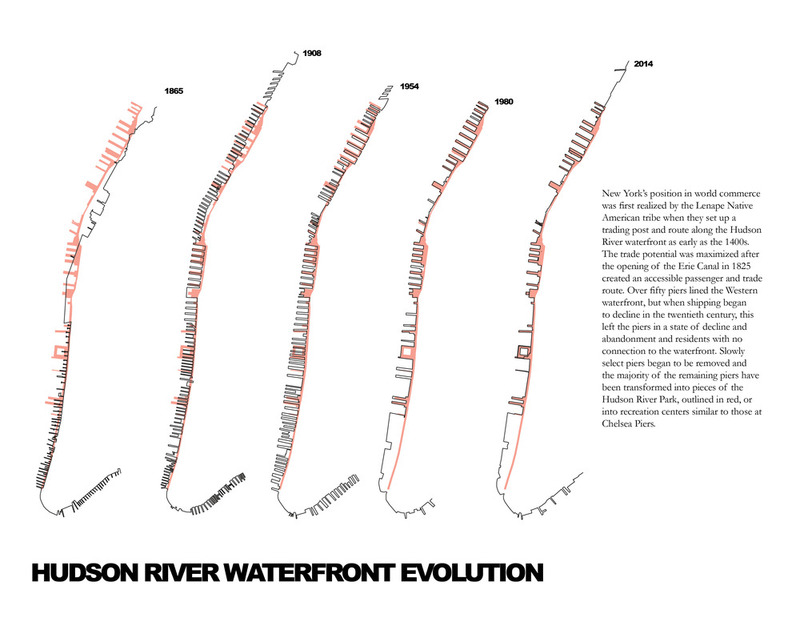 In 1998, the Hudson River Trust was established and groundbreaking began to design the waterfront as continuous park space and bike path for the city. The first completed segment of the Hudson River Park opened in 2003, and Segment 5, designed by Michael Van Valkenburgh Associates, opened in 2010. The Hudson River Park Segment 5 combines both active and passive recreation including a carousel designed by CDR Studio, a world-class skate park designed by Site Design Group, and areas of spontaneous activity including a lawn bowl. The winding walkways connect these pieces of the program to open lawns and tree groves while taking advantage of opportunities for breathtaking views of the Hudson River and Manhattan. Highly utilized by walkers, bikers, and joggers, the park is surrounded by areas of movement created through circulation pathways and the five-mile bike path connecting the entirety of the Hudson River Park. The combination of the paving patterns, landscaping, and sculptural gardens designed by Lynden B. Miller and Meg Webster create intimate moments within the greater context of the park. Located between adjacent restaurants such as the Frying Pan and ‘Wichcraft, the park contains everything from a quincunx of trees creating a shaded grove to a beach boardwalk on the end of Pier 62. Even in the winter, one can witness people strolling along the frozen water and joggers and bikers actively utilizing the bike path. In an effort to minimize the damaging effects of flooding, the most expensive parts of the park, including the skate park and the carousel, are elevated higher than the surroundings and pulled away from the edges of the park. Flooding and rising sea levels were anticipated, so salt-tolerant species of plants were incorporated into the design. Built to withstand seawater rising and hurricane threats, the utilization of lightweight foam below a heavy layer of soil protects the park against impacts from debris in the river including runaway vessels. This design proved to be extremely effective when the 2012 Hurricane Sandy storm flooded 60% of the park with five feet of water and the park was nearly unaffected.